It’s time that we got more impatient for change, and started finding new ways to empower and support female candidates and political leaders. 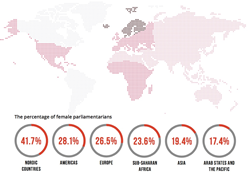 A new report assessing the barriers preventing gender equality in politics was launched today during the Women Political Leaders Annual Global Summit in Reykjavik, Iceland. “Getting Impatient: Overcoming barriers to women’s political leadership & accelerating progress towards equality,” examines the current state of play for female political leaders and the practical steps that individual political candidates, parties, and organisations can take in the absence of systemic change. It also profiles 50 "Women to Watch" who are breaking down barriers in their countries and setting examples of what strong female leaders can achieve, often in the face of entrenched resistance. An analysis of the countries surging ahead on the path to equality and those falling behind. The report marks the launch of an innovative social enterprise – Atalanta – which aims to close the gender gap in politics by providing professional campaign and communications services to female candidates and officeholders. Atalanta is a social enterprise whose mission is to increase the number of women holding senior government positions worldwide and accelerate programmes that tackle the root causes of gender inequality. It was created to fill a gap in the advisory services that female candidates and officeholders have access to, providing professional expertise and strategic guidance through a female-led team of experienced consultants. Atalanta dedicates 1/3 of its profits to providing pro-bono or low-bono support for clients who can’t afford their services. Atalanta's Founder & CEO, Eva Barboni, is a political and communications strategist who has managed campaigns across four continents. Her experience includes successful campaigns for mayoral, state-level, and presidential candidates, as well as candidates for the leadership of international organisations. Atalanta’s Founder is available for interviews about the report findings and the launch of the organisation.